PURE CHAGA SCLEROTIUM EXTRACT POWDER: Made exclusively from 100% organic chaga sclerotia. The Chaga is hand picked from Russia, Siberia and Northern China to make the best extract possible. They are extracted with hot water to break down the cell walls and make the active compounds more bioavailable to us. Hot water extraction give us access to the beneficial beta-glucans and thousands of other nutrients. We do not add any starch, grains, or fillers into our products. Just 100% pure chaga. 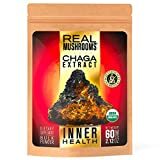 SHAKES | SMOOTHIES | COFFEE | TEA: Real Mushrooms Chaga Extract arrives in an easy-to-use airtight, resealable food grade packaging allowing for as much or as little use as you need for any occasion. For an extra health boost, add it into your coffee, tea, healthy green smoothies, post-workout protein shakes, bone broths, soup stocks, as an extra ingredient in your favorite recipes or maybe even an upgrade in your bulletproof coffee. Our extracts are 80-90% soluble in water. GUARANTEED POTENCY: Real Mushrooms Chaga Extract is guaranteed by analytical testing to have the active, medicinal compounds scientifically shown to boost your immune system. Our extract contains >10% Beta-glucans and <5% Starch. Beta-glucans are one of the main active, most well researched, medicinal compound in chaga. We measure beta-glucans specifically because polysaccharides numbers include starch, so polysaccharide testing can yield a false sense of quality. 100% SCLEROTIA: Our product undergoes rigorous quality control testing to make them Certified Organic, Certified Kosher, Gluten-Free, Non-GMO, Vegan, Dairy-Free and Nut-Free. We guarantee that there is absolutely no added starch, grains, contaminants or fillers of any kind. We use starch testing to show the purity of our extract powders. Our Extract is made from organic, naturally harvested chaga sclerotium. It is hot water extracted to pull out the important beta-glucans. Chaga is a sclerotia. Not a mushroom. Technically, the part of the chaga species harvested in the wild is a highly concentrated mass of mycelium that protrudes from trees (primarily birch) infected with this fungus called Inonotus obliquus. The dark, hard and cracked exterior, which often appears like burnt charcoal, is called the sclerotia. The interior has a rusty yellow brown color. The actual chaga mushroom (fruiting body) is rarely seen and not used in supplements. We test specifically for beta-glucans as these are the most well researched, beneficial compounds in mushrooms. We also test for starch which is used to show that this product contains no fillers of any kind, Just pure sclerotium. If others only list polysaccharide numbers, make sure to ask them for beta-glucan and starch numbers. Starch is a polysaccharide so polysaccharide numbers can be easily spike with grain or fillers. Beta-glucan and starch numbers show product quality. Beware: Many products are made from Chaga mycelium grown on grain and do not use the Chaga sclerotium. In this case, grain ends up in the final product diluting the amount of mycelium present. The mycelium that is grown on grain also lacks many of the beneficial compounds (betulin, betulinic acid, initidiol) as these compounds are derived from Chaga’s interaction with the tree it is growing on (like birch). Extracted from the finest organic coconuts PINK SUN Raw Extra Virgin Unrefined Coconut Oil is a premium oil with high lauric acid content and is naturally abounding in antioxidants. PINK SUN Organic Coconut Oil is ethically produced in Sri Lanka and is non GM. Packed in non leaching HDPE plastic containers – ideal for the bathroom. Also available in glass jars.